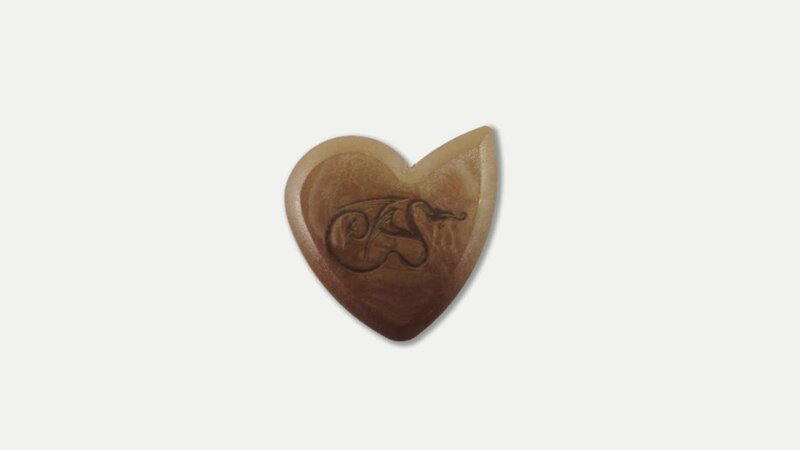 First came the Dragon’s Heart plectrum – a completely new shape and take on the humble plectrum – and now we have the Wyvern’s Heart; same shape but different material and thickness to appeal to those players who like a thinner more flexible plectrum (or pick). For those who have not yet tried a Dragon’s Heart it is completely different to anything I have used before: thick, solid and with three distinct edges which give a different sound and feel to your playing. Personally, I like the ‘round end’ for solos and single note runs; usually I dispense with a plectrum and use my thumb and fingers and if I do use one it is very thin (0.46 or 0.38), so having this in your hand feels odd at first! However, I soon got used to it and found that being gentle was the best option and it became strangely addictive, which is a whole new experience for me! So, enter the Wyvern’s Heart which is the same shape but made from a more flexible, thinner material, which feels more like a regular plectrum, although still much thicker than I would normally use. The original Dragon’s Heart ‘slips’ off the strings and gives a great, warm sound quite unlike anything you get with a ‘normal’ plectrum. The new Wyvern plectrum is more crisp and bright with the three edges giving a subtly different sound and feel to the notes that you pick. Whereas with the Dragon’s Heart I found that I could only play single notes (I’ve never felt comfortable hitting two or more strings with a thick plectrum but if this is your usual choice you will no doubt find it easier) the Wyvern is more like a regular plectrum in this regard. With its unique shape you can use each edge to give you a different sound – and playing speed – to suit the song; as with the Dragon’s Heart your touch can make it sound bright, clean or soft. They come in two sizes – XL and normal – and in a great range of colours – so take your pick! They have also introduced the Wyvern’s Scale plectrum which has a rounded corner and looks more like a normal plectrum, although again you can get subtly different sounds and feels with each edge. Which do I prefer? That’s a close call since both are unique…. Will they take off? I hope so since they are unique and innovative.